Summary: A new device that uses fast flowing fluids to insert nanotubes into the brain may be used to help treat a number of neurological diseases, researchers say. The Rice team’s microfluidics-based technique promises to improve therapies that rely on electrodes to sense neuronal signals and trigger actions in patients with epilepsy and other conditions. “It’s easier to pull things that are flexible than it is to push them,” Robinson said. There’s a small gap between the device and the tissue, Robinson said. The small length of fiber in the gap stays on course like a whisker that remains stiff before it grows into a strand of hair. “We use this very short, unsupported length to allow us to penetrate into the brain and use the fluid flow on the back end to keep the electrode stiff as we move it down into the tissue,” he said. A microfluidic device delivers a carbon nanotube fiber into agarose, a lab experiment stand-in for brain tissue. The device could provide a gentler method to implant wires into patients with neurological diseases and help scientists explore cognitive processes and develop implants to help people to see, to hear and to control artificial limbs. NeuroscienceNews.com image is credited to Robinson Lab/Rice University. Carbon nanotube fibers conduct electrons in every direction, but to communicate with neurons, they can be conductive at the tip only, Kemere said. “We take insulation for granted. But coating a nanotube thread with something that will maintain its integrity and block ions from coming in along the side is nontrivial,” he said. The researchers said their technology may eventually be scaled to deliver into the brain at once multiple microelectrodes that are closely packed; this would make it safer and easier to embed implants. “Because we’re creating less damage during the implantation process, we might be able to put more electrodes into a particular region than with other approaches,” Robinson said. Funding: Supporting the research are the Defense Advanced Research Projects Agency, the Welch Foundation, the National Science Foundation, the Air Force Office of Scientific Research, the American Heart Association, the National Institutes of Health and the Citizens United for Research in Epilepsy Taking Flight Award. Image Source: NeuroscienceNews.com image is credited to Robinson Lab/Rice University. Rice University “Nanotubes Go With the Flow to Penetrate Brain Tissue.” NeuroscienceNews. NeuroscienceNews, 18 December 2017. Rice University “Nanotubes Go With the Flow to Penetrate Brain Tissue.” http://neurosciencenews.com/nanotubes-brain-implants-8205/ (accessed December 18, 2017). Soft and conductive nanomaterials like carbon nanotubes, graphene, and nanowire scaffolds have expanded the family of ultraflexible microelectrodes that can bend and flex with the natural movement of the brain, reduce the inflammatory response, and improve the stability of long-term neural recordings. 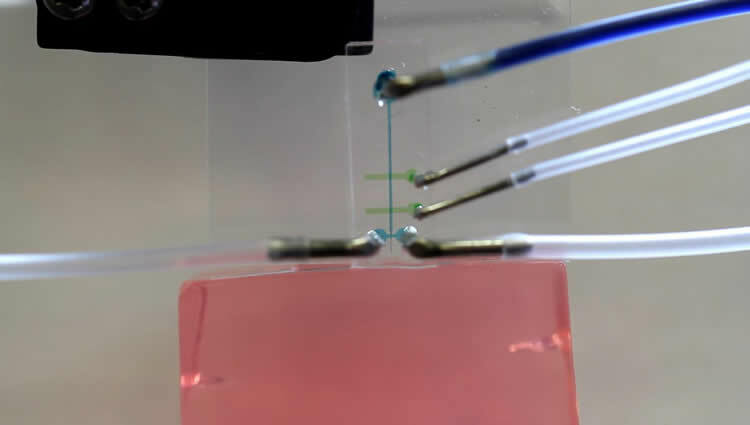 However, current methods to implant these highly flexible electrodes rely on temporary stiffening agents that temporarily increase the electrode size and stiffness thus aggravating neural damage during implantation, which can lead to cell loss and glial activation that persists even after the stiffening agents are removed or dissolve. A method to deliver thin, ultraflexible electrodes deep into neural tissue without increasing the stiffness or size of the electrodes will enable minimally invasive electrical recordings from within the brain. Here we show that specially designed microfluidic devices can apply a tension force to ultraflexible electrodes that prevents buckling without increasing the thickness or stiffness of the electrode during implantation. Additionally, these “fluidic microdrives” allow us to precisely actuate the electrode position with micron-scale accuracy. To demonstrate the efficacy of our fluidic microdrives, we used them to actuate highly flexible carbon nanotube fiber (CNTf) microelectrodes for electrophysiology. We used this approach in three proof-of-concept experiments. First, we recorded compound action potentials in a soft model organism, the small cnidarian Hydra. Second, we targeted electrodes precisely to the thalamic reticular nucleus in brain slices and recorded spontaneous and optogenetically evoked extracellular action potentials. Finally, we inserted electrodes more than 4 mm deep into the brain of rats and detected spontaneous individual unit activity in both cortical and subcortical regions. Compared to syringe injection, fluidic microdrives do not penetrate the brain and prevent changes in intracranial pressure by diverting fluid away from the implantation site during insertion and actuation. Overall, the fluidic microdrive technology provides a robust new method to implant and actuate ultraflexible neural electrodes.